Here's a large-scale model I made of a 555 timer IC (about 10x scale). The body is made in two halves, so the top can be lifted off to reveal the "die" inside. The body is made from ¾" MDF, cut on a fretsaw with a tilted table to get the relief angle and then routed on the CNC router to make recesses for the legs and die. 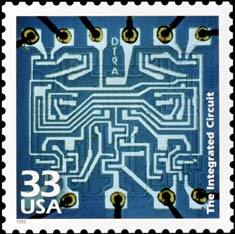 The die itself is a bit of etched PCB, and the design is copied from this photo of a postage stamp I found online. Top and bottom halves are located with a couple of brass pins and are held together with four rare-earth magnets at the corners. After priming, the wood was given a couple of coats of Japlac black enamel. The legs are 1/8" aluminium - a bit thick for this scale, but they look pretty good. The text and logo on the top is done in sign vinyl, cut on my little Craft Robo vinyl cutter. Apologies to ST for nicking their logo! Closeup of the dummy "die"
I had the idea of making an even bigger model, perhaps even in the form of a footstool, but never quite got around to it. Then, lo and behold, I came across the beautiful footstool that EMSL had made! It's really well built - check it out here http://www.evilmadscientist.com/2011/555-footstool/. Guess I need to think up some other large component to make! Also see the large resistor model I made later.